Short Films in Focus: "Franz Kafka's It's a Wonderful Life"
You do not have to know a whole lot about Franz Kafka to understand the joke behind Peter Capaldi's Academy Award-winning short film "Franz Kafka's It's A Wonderful Life." The film explains everything right at the top so as to not come off as too esoteric for the uninitiated. Like the Coen Brothers' "Barton Fink," "Wonderful Life" tells the story of a writer who cannot put a sentence together because of all the distractions and interruptions going on in the tenement building where he resides. Writer's block becomes the universal theme around which many Kafka references can safely circle without losing the audience. Even for someone who has never picked up a copy of Kafka's novella "The Metamorphosis," the film is as funny, dark and weird as its title promises. "As Gregor Samsa awoke one morning from uneasy dreams, he found himself transformed in his bed into a gigantic insect." The word "insect," at this point in the film's story, has yet to be written. A frustrated Franz Kafka (wonderfully played by Richard E. Grant) sits in torment staring at the sentence not knowing what the transformation will be. "Into a gigantic... what!?" A banana? A kangaroo? Capaldi toys with the thought of such things via grainy, Méliès-inspired black-and-white cutaways that reveal a very Monty Python-esque imagination. For Kafka, nothing works. Papers get crumpled up and thrown into the trash. He picks up his ink pen and starts over. To make matters worse, he gets interrupted by a resident named Woland (Ken Scott) who shows up armed with a jacket full of large knives and who cannot seem to find his "little friend" anywhere. Another interruption comes in the form of a saleswoman named Frau Bunofsky (Phyllis Logan) who tries to deliver a large insect costume to Kafka, which he turns down flat and informs her she has the wrong address. Even a free balloon animal cannot cure Kafka's woes. But perhaps the most persistent distraction comes from downstairs where many young ladies are enjoying a Christmas party. Kafka imagines telling them all to be quiet so he can work, but chickens out and goes back to his room to try again. The film borrows its namesake from (where else?) the ubiquitous Frank Capra holiday classic "It's A Wonderful Life," which helps take the film to its absurdist, ridiculously joyous conclusion that, in some ways, feels as poignant as the end of the Jimmy Stewart film. "Auld Lang Syne" is replaced with "Sweet Mystery of Life" in a final scene that would make for a strange little short film in and of itself. It would appear that only at the end does Capaldi's film make reference to that perennial holiday staple, until one takes into account the parallel journeys that Kafka and George Baily take. Both try to make something meaningful in their lives. Both feel stuck in place by outside forces who keep turning up at their doorstep looking for help. Oddly enough, though, Capaldi's film came about when his wife accidentally said in conversation "Franz Kafka's It's A Wonderful Life" when she meant to say Frank Capra, the kind of slip of the tongue that many writers (including, no doubt, the Kafka portrayed in this film) would see as an accidental stroke of genius that gets the ball rolling. Wonderful Life turned out to be Capaldi's directorial debut and was produced with help from Scottish Screen TV. Richard E. Grant, who is good friends with Capaldi, helped get people on board for a short film that would end up costing around $30,000. The money was well spent. "Wonderful Life" looks magnificent, with cinematographer Simon Maggs cloaking Kafka in just the right amount of darkness and shadows to help convey his torment while production designer John Beard gets playful with the interiors and exteriors that bring to mind a mixture of Tim Burton and Robert Wiene's "The Cabinet of Dr. Caligari." Capaldi also had help from costume designer Hazel Pethig, who worked with Monty Python and helped Capaldi keep the film on budget with means to a singing insect outfit that saved a bundle in the production budget. 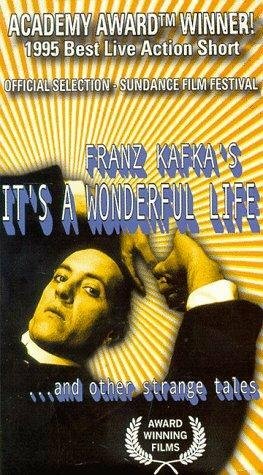 In 1995, Franz Kafka's It's A Wonderful Life won the Academy Award for Best Live Action Short Film. Next Article: Book Excerpt: “Rainer on Film: The Night of the Hunter" Previous Article: Music Box Films Releases New Poster For "Beloved Sisters"